New Delhi,: To mark International Women’s Day (IWD) on Wednesday 8th March 2017, PwC has released a new report – Winning the fight for female talent: How to gain the diversity edge through inclusive recruitment –which looks at what employers can do to attract and retain female talent and underscores the importance of embedding diversity and inclusion into the employer brand. 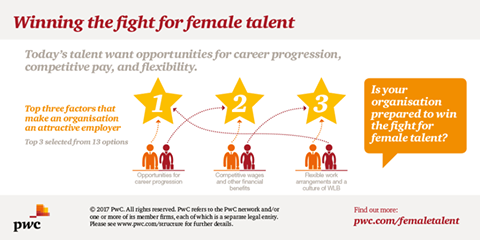 PwC surveyed 4,792 professionals (3,934 women, 845 men) with recent experience of the jobs market from 70 countries and from different organisations to find out about their career aspirations and employer diversity experiences and expectations. In parallel, PwC surveyed 328 executives with responsibility for diversity or recruitment strategies in their respective organisations to explore current diversity trends and practices within employer attraction and selection activities. Female and male respondents ranked opportunities for career progression among the top three employer traits, along with competitive wages and flexible work arrangements. Female career starters and female millennials identified this as the most attractive employer trait, as did women overall in Brazil, China, France, Hong Kong, India, Ireland, Luxembourg, Poland, New Zealand, Russia, South Africa and the UAE. The report also found that women who had recently changed employers said a lack of opportunities for career progression was the top reason they left their former employer (35%). Satyavati Berera, Chief Operating Officer, PwC India- “Having a diverse and inclusive workforce is no longer just a talent imperative but a business one as well. Today, organisations are revisiting their policies and processes to make sure they are more aligned with the changing needs of the modern workforce, with increased focus on women. 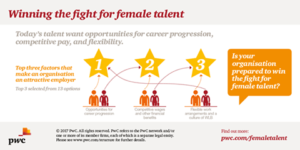 At PwC, we offer unique programmes to take care of the special needs of women employees in different phases of their lives and their advancement as leaders. The survey revealed that just over three quarters (76%) of employers have incorporated diversity and inclusion into their employer brands – and this rises to 88% of companies with more than 10,000 employees. But the report also highlights that just talking about diversity as part of an employer brand is no longer enough. When deciding whether or not to work for an employer, over half (56%) of women are looking to see active diversity progress. This rises to 61% for female career starters. Meanwhile, 61% of women and 49% of men look at the diversity of an employer’s leadership team when deciding to accept their most recent position. And 67% of women explored if their employer had positive role models who were similar to them when deciding to accept their most recent position, rising to 76% for female career starters. This factor was particularly important to women working in sectors that are widely regarded as relatively male-dominated, such as FinTech (85%), Engineering and Construction (82%) and Asset Management (78%). The message is clear: organisations should walk their diversity talk or face contending with increased difficultly attracting talent, particularly female talent. The report highlights we are seeing organisations across the world inject greater urgency into their gender diversity efforts. Explicit hiring targets have emerged as a core driver in fulfilling these ambitions with 78% of large organisations around the world saying they’re actively seeking to hire more women – especially into more experienced and senior level positions. As organisations fight to attract female talent – particularly at levels and in sectors where they’re currently underrepresented – we’re now seeing competition for female talent escalate to a whole new level. A HeForShe Corporate Impact Champion, PwC is committed to helping to close the global gender gap. HeForShe is a movement by UN Women which aims to mobilise one billion men and boys in support of global gender equality. As part of our involvement, we’ve joined forces with UN Women to develop a Building Gender IQ eLearn module that seeks to educate people around the world on the negative impact of societal gender stereotypes and the importance and benefits of gender diversity in the workplace and beyond. During the month of March, we’re calling on all our people, and particularly our men, to take a stand for gender equality by making the HeForShe commitment. “Gender equality is not a zero sum game — it will bring better opportunities to men and women alike (including at leadership levels), will benefit the economy, and will help all of us work better across various differences. Eradicating societal gender-based pigeonholes and enabling both genders to contribute equally in business and their personal lives are win-wins.